UPDATE: The new gifting system is a great way to keep addon authors interested: Please check the Donate tab! Also, major thanks to esoui.com member Shinni for ItemPreview/LibPreview which made the 3D previews possible! SEARCH OR TRACK BY IMPROVEMENT LEVEL: New in version 1.52 is the ability to show all recipes of an improvement level by clicking the numerals at the bottom right. Shift-clicking these will set all recipes of that improvement level to tracked, which is very helpful when leveling your cooking as you can quickly add tracking icons to only the recipes you need in the search results at guild stores. TEXT SEARCH OPTION: To search for a recipe you can hover your mouse over the bottom right of the window and click in the search box, and type the name. You can also search for all recipes of a certain level range by typing a number in the search box. For CP levels type "cp" (without quote) followed by a number. Additionally, typing "cp1" (no quotes) will show all recipes that scale from 1 to max level. NEW 3D FURNITURE PREVIEW: Can now right-click items on the furniture list to see a 3D preview! NOTE: There are some items that will not show a preview due to current API limitations. 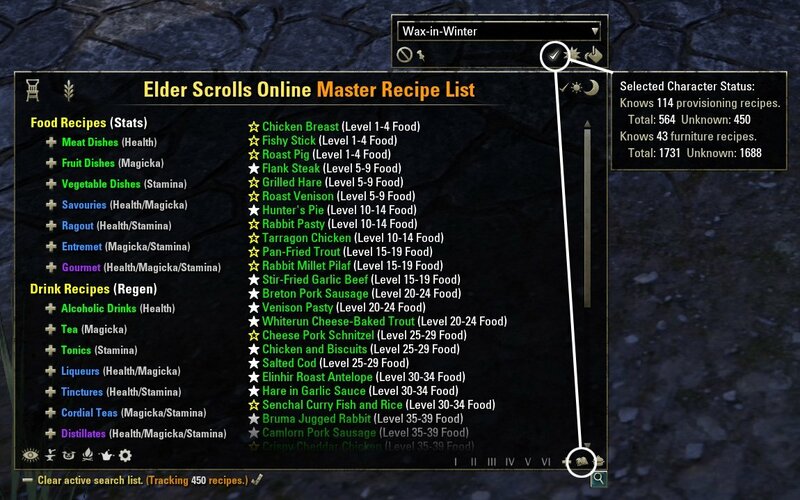 Master Recipe List window with all cooking and furniture recipes in ESO. Browse labeled and quality color-coded categories or text search for recipes at cooking stations. Single-click search for all recipes required for current writ (now works in non-English!). Option to show list of characters that know the recipe or that can make a food item in the tooltip. Scroll list shows which recipes are known, unknown, writ-required, or tracking. Adds additional tooltip info for tracked ingredients and recipes (and those needed by writs). Bind a show/hide key under ESO Master Recipe List in control settings. Slash commands available: /mrl and /recipes will both show/hide the window. Auto-mark all ingredients needed by all currently tracked recipes combined. Popup tooltips for all list items (can be toggled between recipe and created food tooltips). Shift-click any item to link in chat. 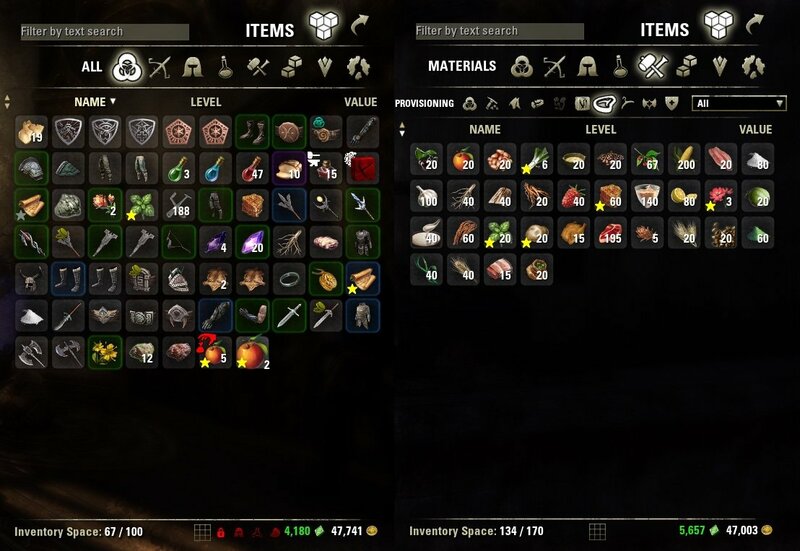 Inventory and guild store icons for tracked/known/unknown (optional) recipes and ingredients. Sliders to customize the positioning of the inventory icons globally. Added new recipe configuration panel (click the book icon to toggle)! All characters that know any recipes and are tracking show in the above list. Select all recipes as tracked with a single click. Select as tracked all recipes NOT known by the currently selected character. Select all recipes in a tier (left side navigation) as tracked by shift-clicking nav button. Set up per-character filters to auto-junk or auto-delete untracked recipes and ingredients when looting. Save/load tracked ingredient selection to global ingredient profile. Added option to show ingredients in craftable food item tooltips. Added option to ignore stolen items when auto junk/delete is on. Food and Drink categories are now color-coded by the quality of food or drink they produce. Optionally add stat icons to each category showing which stats their created food or drinks will buff. New writ tracking system! Categories show gold check, recipes highlighted gold. Added "needed by current writ" to the created food tooltips that show in the provisioning station. Added button to open/close MRL from the provisioning station. Added button to toggle showing blue check by categories containing known tracked recipes, and highlight these in blue. Added button to show/hide the created food tooltip at the cooking station. Implemented new "alt tracking mode" for inventory icons. 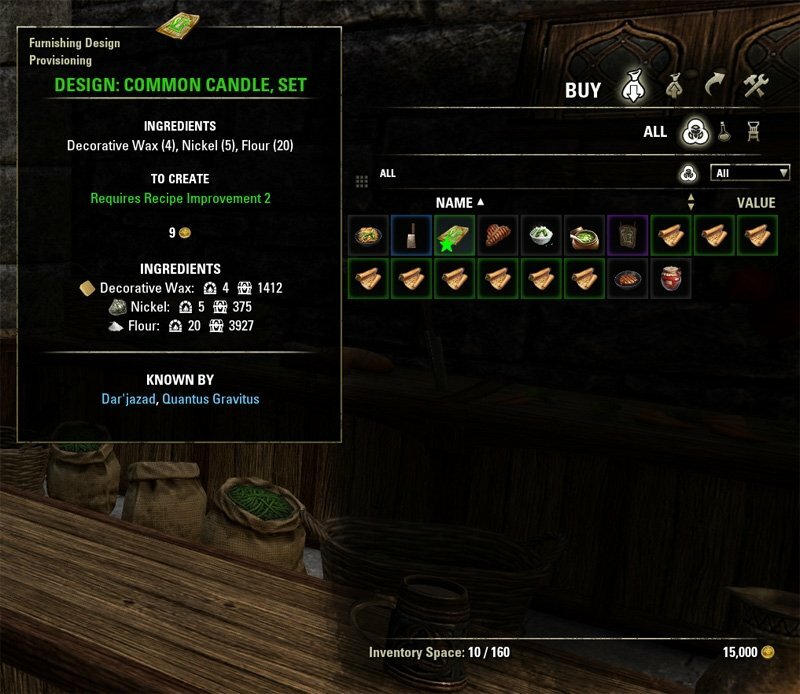 Added support for the Psijic Ambrosia recipe and items. Allows opening/closing any category (or multiple categories) at the cooking station. 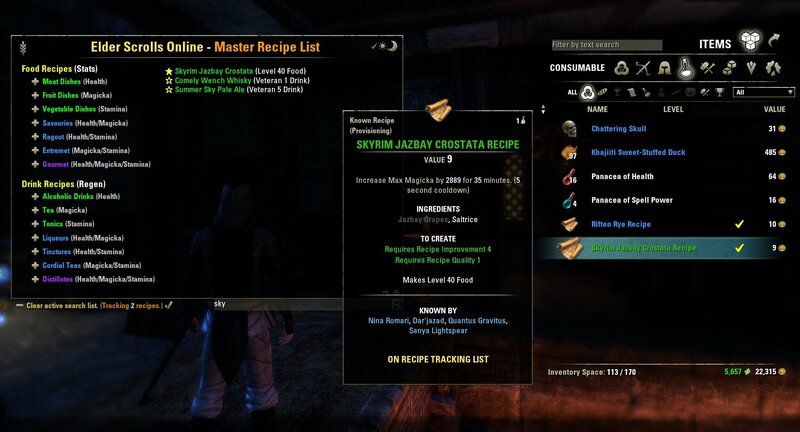 Added new Orsinium recipes as well as all event recipes. Search for all recipes that use all selected ingredients. Writ tracking for ingredients and food items! NEW: Support for all Homestead craftable furniture items! Added new "Reset Navigation" button (moon icon) at cooking station to collapse all categories. Can now choose a different characters for food and furniture when tracking unknown recipes with inventory icons. NEW: Can now click to navigate or shift click to track all recipes by improvement level! NEW: Added option (plus sign at bottom right) to set all recipes currently showing in the list to tracked. * NOTE: There are some items that will not show a preview due to current API limitations. Includes English, French, German, Italian, Russian, Japanese, and Spanish language translations. Uninstall MasterRecipeListAltFormat (not part of this addon and while maintained by the author, is no longer necessary as the functionality is built-in to this addon now). Go to \Documents\Elder Scrolls Online\live\SavedVariables\ folder and manually delete the MasterRecipeList.lua saved variables file. Go to \Documents\Elder Scrolls Online\live\AddOns\ and manually delete the MasterRecipeList folder. 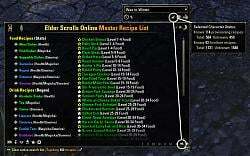 Re-download and install ESO Master Recipe List. Start the game and log in to each of your characters. Click here to view my other addons, or view my Skyrim mods here. Test fix for campaign manager related LUA errors. Fixed error caused by FCO Item Saver support options not properly distinguishing between furniture and provisioning recipes. Possible fix for rare un-reproducible error. Fixed station tracking marks not always updated until mouseover visual bug. Fixed a problem with shift-click linking items in chat. Fixed error in non-English client languages on opening the MRL app. Added MRL tracking marks, search, and other capabilities to the furniture crafting tab of all stations along with provisioning! Opening MRL or searching from a station control panel will automatically detect the station type and open the appropriate section. Added new option to color detailed ingredient list items by quality level like at crafting stations (on by default). Completely rebuilt the ingredients tab, now showing all items used as ingredients in any recipe (originals are all together on the left). Option to find all cooking or furniture recipes that use selected ingredients as separate buttons. Find all ingredients used by all currently tracked recipes. Auto-junk and delete still only work with standard ingredients so no worry of deleting valuable ones. Buttons to track all standard ingredients, all special/furniture ingredients, or everything separately. Cool new layout. Improved text search and other special result lists so when you click clear all tracked it keeps the current results shown instead of resetting. Fixed a bug where after completing a cooking writ, viewing other crafting lists and clearing your selection would populate the tooltip with the last selected cooking writ item. Fixed the hide station tooltip button to be instant and no longer flash the tooltip visible when changing recipe selections if hidden. Major housecleaning of all database tables and other files. Most converted to dynamic virtual tables created on demand in code, eliminating unnecessary redundancy. Major code cleanup and streamlining. Reduced file size by ~25%. Various other modifications and maintenance. Fixed error related to Gamepad mode seen when closing the cooking station. Added 3D preview support for Gamepad mode. Added note on startup that tracking icons & station modifications are not available in Gamepad mode. When switching between Gamepad/Keyboard mode you MUST /reloadui in order for addons to re-initialize! Test fix for reported error (unable to reproduce). Changed icon for the known/total recipe tooltip to be more intuitive (and less redundant). Added new feature to automatically select and scroll to un-crafted writ items when you open their category at the cooking station. Added requested option to show housing editor category on furniture recipes and crafted items (enabled by default). Changed the "Search MRL" button at the cooking station to be more obvious and added support for searching furniture recipes as well. Fixed an annoying bug that would cause you to get stuck in cursor mode interacting with anything after searching MRL from the cooking station. Fixed a bug where if you closed MRL from the furniture page, the 3D preview-able toggle button would show on the recipe page. Updated many of the database tables to remove unnecessary information (reduced file size). Fixed errors related to color pickers in addon settings (update LibPhinixFunctions). Fixed errors related to FCOIS addon and various setting combinations, which are what was generating errors viewing guild stores and having FCO marked recipes in your inventory, etc. Rebuild the inventory tracking mark code to correct some discrepancies between the displayed and expected value for the text popup on tracking icons. Added Polish language support and Google translation. Various other code and language file maintenance. Fixed another error due to new multi-language code for ingredient list icons being put in the wron place. If you viewed a recipe before opening master recipe list once after login you would get an error. Relocated code to ini block. Fixed errors caused by commented section of code from previous debug process. Removed other left over debug code from script. Fixed new ingredient list icons to display properly in any language. Changed the behavior of the new 3D preview toggle icon so that you stay on the search page you were on when toggling it. Fixed typo causing errors when text searching for furniture. Added button to lower left of MRL furniture recipe panel to toggle showing icons next to recipes that can be right-click 3d-previewed. Added possible fix for non-reproducible error. Added new detailed ingredient list option (separate for recipes and result items) which displays each ingredient required, how many the recipe calls for, and how many you have. Additional options to disable each at guild stores. 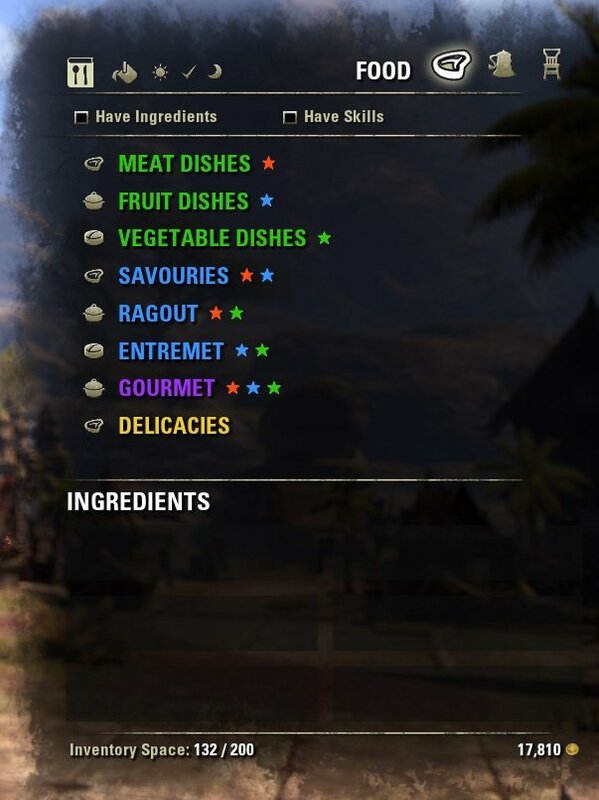 Fixed a long standing bug where tracked ingredient indicators were not properly showing for the gold 'Delicacies' recipe sections at the cooking station. Fixed a possible rare bug where crafting writ indicators might not show up. Improved option section related to auto-junk and deletion with description of the requirement to toggle the button in the MRL app. Migrated global functions to LibPhinixFunctions for speed and streamlining of code. Please manually install the LibPhinixFunctions library. Added vendor NPC support for GridList. Devised a better method of handling tracking icons at NPC vendors with Inventory Grid View support. Icons will now appropriately adjust depending on your view mode, even if you toggle it while at the store list. Appropriate list mode icons will now appear in list mode unlike previous imperfect method. Added new option for "Vendor icon position" under the icon settings to customize the position of the tracking icons at the store. Modified NPC vendor sell list hooks to support Inventory Grid View. Note that due to API limitations switching display modes cannot be properly supported, so you will see grid mode icons even when in list mode when viewing the purchase tab. This will not effect tracking icon functionality and is purely a visual behavior. Added tracking icon support to the NPC vendor sell list interface. Added Murkmire and other supported items to the 3D preview option when right-clicking furniture recipes in the MRL lists! Fixed a bug that was showing the Ingredient legend when viewing the Furniture Recipe section. Fixed a bug causing errors when FCO Item Saver support options were enabled. Added new button to the Recipe Tracking Panel to show the recipe knowledge and stats for the selected character. Restored tracking icon functionality for trade house listings and search results. Added realtime tracking icon update support to player house storage containers. Quick fix for new guild store search generating errors. Tracking icons will not be visible on guild store search results until a more permanent fix in a future update. Added new legendary furniture recipes to the lists. Removed included Libstub/LibAddonMenu to avoid possible version conflicts in the future. Due to the addition of many new recipes the database stucture has changes significantly, and therefor requires logging into each character once more. I realize this is soon after the last major update but this is merely an unfortunate coincidence. This is usually only needed once per expansion/DLC that adds new recipes. Fixed debug message about ignored due to stolen filter when auto junk/destroy not being applied for object. Fixed tooltip name list sometimes showing gaps between names. Added new option to alphabetize 'known by' and 'craftable by' tooltip lists when enabled, or use the order characters appear in on the login screen. Added new display mode "Shift Toggled" to tooltip 'known by' character display. Holding shift while bringing up the tooltip will show the list of characters that do NOT know the recipe. Not holding shift shows a list of characters that DO know the recipe. Changed saved variables to be specific to the Megaserver you log into so you can switch between PTS, NA, or EU with the same @account without getting overlapping character data. Changed to unique ID-indexed character saved variables to make addon settings name-change proof. Improved character deletion function to automatically disable tracking character feature if a tracking character is removed. Updated all translations with Google Language for not yet translated lines. Added comments to all saved variables in the \bin\Defaults.lua file and all variables in MasterRecipeList.lua. Various other cleanup and improvements. Saved variable structure has changed significantly this version and must be reset. The addon will do this automatically, howver you must log in as each character at least once to add them to the database. Added new option "Enable icon text overlay" under the Inventory Icon Options section of the addon settings. Off by default, this lets you enable the text symbols over the inventory tracking icons as an alternative or in addition to the information provided by the new icon tooltip setting. Mainly included for colorblind support. Fixed ingredient tracking icons not working properly (value reversed). Added craft bag to the function that instantly refreshes views when tracking status changes. Now the craft bag will instantly update icons like other inventories. Fixed a bug with FCO Item Saver and improved support options. Fixed* (needs testing) a bug with ignore guild store food ingredient tooltip option. Fixed* (needs testing) an error message that could occur in certain upgrade/reinstall scenarios. Preliminary Google translation updates for all new interface text (need updated human translations!). Overhauled the configuration options and behavior for inventory tracking icons. Added new option to show tooltips on inventory tracking icons with descriptive info. Furniture navigation triangles now stay toggled to show what list you are viewing. Further improved addon settings layout to accommodate new options. Included new furniture patterns added since Summerset and removed no longer existing patterns. Completely reorganized addon settings into clear categories and made most settings global. New options to fine-tune the addon's behavior including showing characters that DON'T know a recipe in the tooltip. Addon will now auto-clear characters that no longer exist on your account when you log on. Added additional option to FCO ItemSaver support to auto-lock unknown recipes (by current or tracking character). Fixed error when opening Emperorship menu in Alliance War. Improved addon startup time on log in. Recipe lists now properly scroll to top when selecting a new category. Updated libs and API for Wolfhunter. Fixed the black text bug. Added new Furniture category for browsing Jewelry Crafting recipes. Enabled the new Jewelry Crafting recipes to be tracked. Library update & API bump for Summerset. 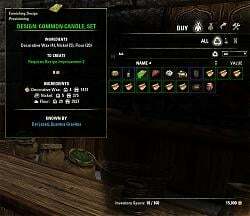 Added new Summerset furniture and provisioning recipes. 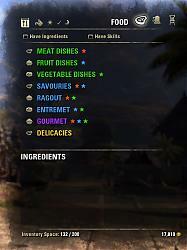 New provisioning food and drink are under the existing Psijic special category (click the eye on the bottom left). Added the ability to 3D preview with right-click from search results list (some things still not supported by API, mostly gold patterns). Various other tweaks and database maintenance. Need to log in each character to rebuild. Updated Russian translation (thanks KiriX). Fixed errors caused by update to CraftStore. 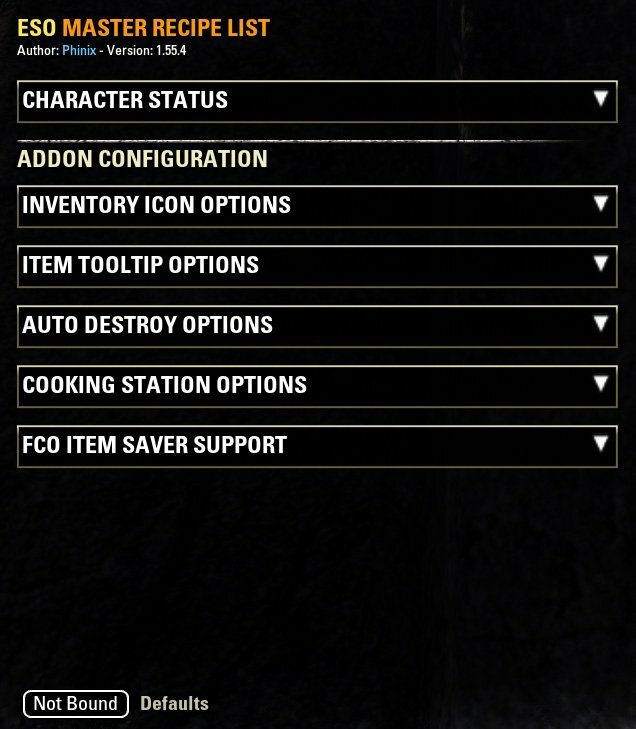 Improved CraftStore integration so you don't have to /reloadui when you toggle Cook Station support on and off in that addon in order to update Master Recipe List's behavior. Fixed auto-delete ingredients not working due to value being passed to function as a string instead of a number. Fixed visual bug with toggling unknown recipes needed for writs between tracked/untracked. Fixed writ lookup using manual recipe total rather than global updated total (no symptoms). Update for Dragon Bones. Should fix all errors and adds a few new furniture recipes. Library and API updates also, please report any issures. Main window can now be moved partially off screen, making it easier to see only things you are concerned about. Can type "/mrl reposition" (no quotes) to reset the main window to the default position if you accidentally drag it into oblivion. NEW: Can now right-click items on the furniture list to see a 3D preview! NOTE: There are some items that will not show a preview due to current API limitations. Hopefully Zenimax won't fail us and adds complete link preview options soon, but in the meantime you can use Item Preview by Shinni to search those items that don't work at a guild store and preview them from there (from either the recipe or created item results). Updated Spanish language translation (thanks Inval1d). Fixed error when clicking Clothing quality 5 (gold) category and any below it on the Furniture page (caused by a typo which was using the total cooking recipe count to build the initial saved variable structure for the total furniture recipe structure as well instead of its own, which was causing lookup functions to that table to break after 562 (total cooking recipes) which just happened to be where furniture clothing quality 5 starts). Added some comments to various code functions for clarity. Significantly sped up the new Track Shown Recipes function. Changed the Track Shown Recipes to not flip back to the top of the list, now works like the other list functions. Fixed mouseover character and stat sheet errors (for good!). Improved the way the scroll lists are updated when you click a recipe. Now if you are scrolled way down on a list and toggle a recipe's tracking status, it will no longer pop you back up to the top of the list, which was very annoying. Fixed error introduced in last update when clicking an item in the list generated by clicking the new quality tiers. Ingredient tracking is now global and shared over all characters. Added new option "Track all listed recipes." This is the small '+' button at the bottom right. This will set all recipes currently showing in your search result list to tracked. Useful for tracking batches of recipes. For example, you could click an improvement tier to show all recipes that are craftable at that tier, then hit the '+' to track them all so they show an icon for guild store searches. Added support for normal MRL station modification when CraftStoreFixedAndImproved is loaded, but only when "Use CraftStoreCook" option is disabled in the CraftStoreFixedAndImproved options. Having both at the same time is not feasible at present as CraftStoreFixedAndImproved does extensive modification of its own and hooking deeply enough to integrate specific features is risky and prone to breaking with updates, however this will at least allow you to still use MRL for the cooking station and CraftStoreFixedAndImproved for everything else. Fixed another error related to overlapping functions. Fixed an error caused by mousing over the "No entries in this category" text on some white-level furniture categories. Fixed error caused by typo in furniture provisioning database. Fixed text search bug related to an indexing typo that was causing some of the special event recipes to not be text-searchable. Major overhaul of the code and database structure. Added all new cooking and furniture recipes from Clockwork City DLC. Added new feature to click navigate or shift-click track recipes by improvement level. API bump for Clockwork City. Fixed support for FCO Item Saver. Fixed some non-English language format issues. Minor code and language file maintenance. Added support for the latest CraftStore Fixed and Improved. Added the option to choose a different character for food and furniture when tracking unknown recipes with inventory icons. Added new "Reset Navigation" button (moon icon) at the cooking station to close all open categories. Added number required to craft to optional created item ingredient list. Fixed a bug where clearing all tracked recipes while at the cooking station sometimes wouldn't remove all category marks. Fixed the option to auto-uncheck recipe filter boxes on cooking station activation. Fixed a bug that caused the cooking station to still use the default behavior of opening the 1st recipe tree automatically. Now when you open the cooking station all recipe trees will start closed, making it easier to find writs or tracked items. Fixed a bug with hiding the cooking station tooltip. Fixed the cooking station button to search/lookup recipes in MRL. Added the 15 new patterns added since Morrowind. Cleaned up database tables. Some previous entries were removed from the game. to rebuild their database of known recipes, however you will not have to reconfigure other options. Fixed errors when switching furniture preview items. Fixed indexing problem with event cooking recipes. Updated with all furniture recipes added in Morrowind. Added Aetherial Ambrosia recipe to XP potion section. you do or don't know for all the Homestead craftable items currently in the game (1108 at current count). All event recipes are now supported (see icons at the lower left of the recipe panel). Various other updates and tweaks. See video for details. Fixed typo causing Dubious Camoran Throne text to still appear black in cooking list. Fixed LUA errors when browsing sub-categories in the housing editor purchase section. Updated bag hooks to use ZO_PreHook (avoid potential insecure code issues). Fixed text still being black for furniture tab at the cooking station. Fixed text being black for known patterns at crafting stations. Updated for Homestead. Fixed errors on new furniture tab at crafting stations and cooking result tooltip showing up where it shouldn't. Updated Russian translation (thanks Scope). Updated level range text search function. Searching for "cp1" (no quotes) will now show all recipes that scale from 1 to max level. "Have Skills" filters when you first open the cooking station. On by default. automatically lock recipes or ingredients you are tracking in FCOItemSaver when set to true, but will no longer prevent manual locking. Changed Psijic Ambrosia selection tooltip to "Recipes" (plural) to indicate new 150% drink. Updated French, German, and Italian special recipe selection tooltip text. Tweaked Orsinium reecipe icon to match other special/event icons. Added missing "Recipes" to "New Life Festival Recipes" tooltip. Added support for all New Life Festival recipes. Added proper quality-based coloring to the special recipe lists. Fixed (hopefully) display in Japanese clients. Backwards compatibility for the old version of Craft Store. Proper update for One Tamriel, removes all references to "Veteran" levels. Corrects tooltip display to account for One Tamriel changes. Updated all recipes/results with correct scaling range. Updated level-based text search. Type a number or the letters CP plus a number to see recipes/items for that range. Fixed an issue causing the updated version of CraftStore to overlap at the cooking station. Fixed a typo that prevented linking the new recipes. Added support for all Witches Festival recipes. Updated Russian localization to new format (Thanks KiriX). Added Japanese localization from user k0ta0uchi. 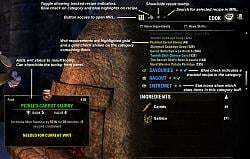 Updated API for Dark Brotherhood. Updated to latest LibAddonMenu and LibStub. Fixed a display bug that would show a blank tooltip at the cooking station if you didn't yet know any recipes. Changed UI behavior so that opening the Master Recipe List window automatically puts you in cursor mode for easy navigation. Closing MRL puts you back in normal game mode. Updated to latest LibAddonMenu r20. Updated to latest LinAddonMenu r19 and LibStub r4 libraries. the button to select all recipes not known by a selected character, and when loading the global ingredients profile. 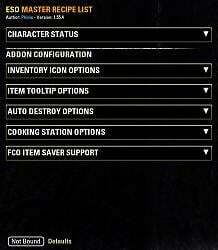 NEW OPTION: Added option to disable tracking of known status of recipes by selected alt in the addon settings menu. Alt character status tracking now disabled by default unless enabled. next to food items and ingredients required by a current provisioning writ, and tooltips will indicate they are required for the current writ as well. to their proper color when the writ is completed/satisfied. NEW FEATURE: Added the ability to search for all recipes that use all of the ingredients you currently have selected on the ingredients tab! any time you change your current tracked selection, to prevent accidental junk/deletion. Added cooking station compatibility with CraftStore. Updated with the latest Veteran 15 recipes. Those added but not yet available in-game are marked with an asterisk (*). Fixed an issue where recipe searches from the cooking station would fail for non-English language names containing special characters. even when multiple recipes contain the same text. Fixed a conflict that was causing the game to crash when activating a cooking station when Master Recipe List and Circonian's FilterIt were both running. Added new feature to text search to show all recipes that create a certain level food. Simply enter a number, for example 40, in the text search, and all level 40 food/drink recipes will show. For veteran 1 foods and drinks, type 50. For veteran 5 type 55, and for veteran 10, type 60. Fixed a typo. I accidentally left quotes around a string variable which was causing it to be treated as a text string instead of a variable, which was causing writ detection to sometimes not update properly. Also improved the code for writ detection in general to be more streamlined using condensed loops based on stage requirement lookups instead of fixed number checks. Now gives 100% accurate detection. Finalized French translation (thanks to Ayantir!). All translations now completely non-Google. Revised the new writ detection system with proper names for objective detection. I hadn't accounted for the fact that the turn-in destinations change. I also installed the Russian and Italian ESO translation projects to test in those languages as well as German, French, and English. Fixed an issue that would cause the header text to wrap a blank line on languages where the text was significantly long, resulting in an ugly gap between the title and the recipe list. Added completed translation files for Italian, German, and Russian thanks to DarioZ, Baertram, and KiriX, respectively. Added workaround for strange ZOS inconsistencies where sometimes the requirements to complete a quest are not numbered in order. This comes into play in ESOMRL for writ quest detection, where writ requirements were sometimes not being properly detected because even though the log showed them as requirement 1 and 2, they might actually by 2 and 3 and requirement 1 returns blank. Don't ask me why, but this should fix it. Changed the way the 'known icon' option works for inventory options. Now by default it shows a green check for recipes NOT known by the selected character (defaults to current character), and has an option to show grey icons for recipes that character already knows. Additionally, there is now an option, when the above known icons are on, to show these grey icons for recipes the current logged in character already knows, regardless of which character you select to show green unknown icons for. Fixed a type that was causing setting changes for inventory icons to be ignored. Now properly clears the selected recipe when checking or unchecking cooking station filters. Previous version supported clearing the current selection and ingredient list (ands hiding the tooltip) when changing categories. Update is for consistency. Re-enabling cooking station tooltips after disabling them will now correctly only show the tooltip if there is currently a recipe selected. Fixed a rare issue where the pre-login gear equipping the game does could trigger an error in the EVENT_INVENTORY_SINGLE_SLOT_UPDATE event. Fixed a bug that would cause debug text to notify you of items ignored by the stolen item filter setting even if you had debug mode turned off. Overhauled the cooking station category display functionality. Previously you would always have one recipe category open no matter what. Now when you open the station no categories are open. You can open any category by clicking it, and close it by clicking again. You can even open multiple categories at once! To close all open categories, simply switch from the food to the drink tab and back or vice versa. Vast improvement to the format of French, German and other non-English languages. All category names now generated from the game, and proper capitalization of words greater than 1 character now performed using zo_strformat. Significant performance improvement of text search in non-English language clients. Fixed a bug where if station stat icons were turned off and display of tracking indication was on while known recipes were tracked, the tracking check could be duplicated when moving the mouse over the category header. Fixed a rare bug where the check marks for writ requirements and tracked items wouldn't appear on the category until after you had changed tabs. Optionally add stat icons to each category showing which stats their created food or drinks will buff. Option to choose between stars and circles for the stat icons. New writ tracking system! Categories which contain a known recipe currently needed for a writ will show a check mark next to them making the recipe easy to find. Furthermore, the recipe itself will be highlighted gold. These marks will automatically clear once you have satisfied the writ requirement. 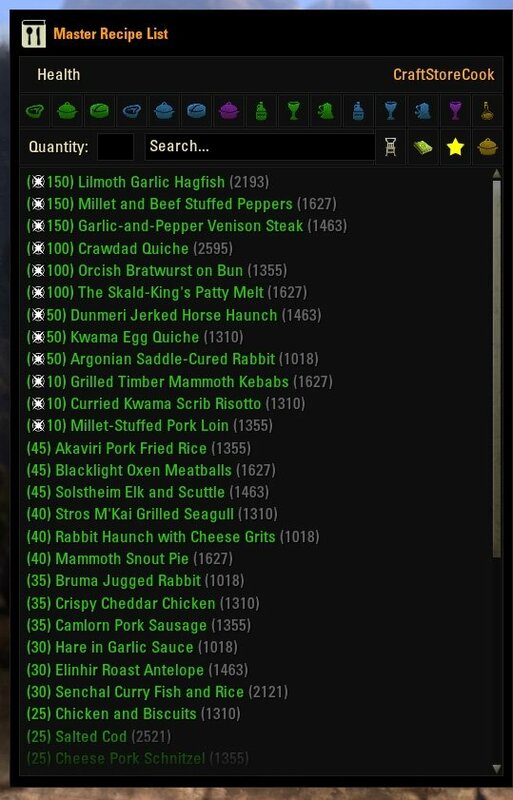 Never search through your quest/recipe list for a writ item requirement again! Added "needed by current writ" to the created food tooltips that show in the provisioning station, if the item is in fact needed by a current writ. Added button to toggle showing a blue check mark (like the gold writ check) by categories that contain known tracked recipes, and also highlight these in light blue. Useful for queuing up a "shopping list" of foods/drinks to make and easily browsing directly to them at the cooking station. Added button to show/hide the created food tooltip at the cooking station. 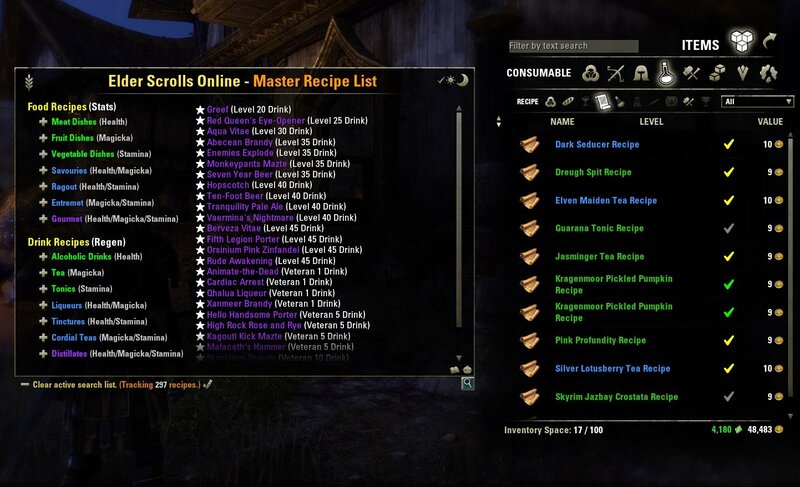 Helps to make room for the Master Recipe List window! Added button to search for a recipe you have selected at the cooking station in MRL. Useful for quickly sending links. Implemented new "alternate icon" mode for inventory icons. By default the inventory icons are gold for tracked recipes, green for recipes you know, and grey for recipes you don't. By enabling the new alternate icon mode tracked recipes will still show a gold icon, however you now have the option to select a character to check for unknown recipes for. Any of your tracked characters can be selected, though it defaults to the current character you are logged in as for each. When this option is enabled and a character selected, a green icon will show for any recipes the selected character does NOT yet know. Also, an additional option lets you disable the grey icons completely. Otherwise, any recipes the selected character already knows will show a grey icon. 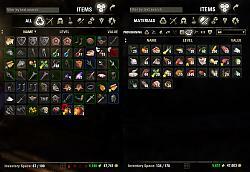 Fixed a bug where turning inventory icons completely off when they had been previously enabled would cause known recipe icons to remain in the inventory. Fixed a bug in the new alternate inventory tracking icon mode where icons could sometimes get "left over" and appear on recipes they shouldn't. Controls are now properly recycled. Added many improved French translations thanks to Ayantir. Fixed debug text showing for stolen item filter even when debug mode was turned off. Added missing Russian translation for new options panel items. Modified debug text output to omit stack count for recipes. Reverted to double quotes for character name string variables to test fix for some users seeing errors in 1.33a-c. Fixed known recipe tracking icons showing up for ingredients. Fixed recipes with hyphen would sometimes not be detected as a writ requirement. Fixed typo causing wrong languages to display. Added support for Inventory Grid View. Changed behavior of inventory icons. Will be yellow when tracked, green if not tracked and known, and grey if not tracked and known by an alt. Added custom tooltips to guild store listings panel. Re-implemented localization using global table instead of ZO_CreateStringId for proper UTF-8 support without codes. Added proper translation support for auto junk/delete debug text. Improved the format of debug text ('3x Apples' instead of 'Apples x 3'). Moved inventory icon enable option to global settings with sliders. Improved speed and versatility of global tracked item check (for devs). Cleaned up the global UI table by renaming main frame so all fall below ESOMRL_ heading. Several code changes and optimizations. Updated to latest LibAddonMenu and LibStub (optional dependency). Restored auto-junk and auto-delete functionality accidentally disabled in last update. 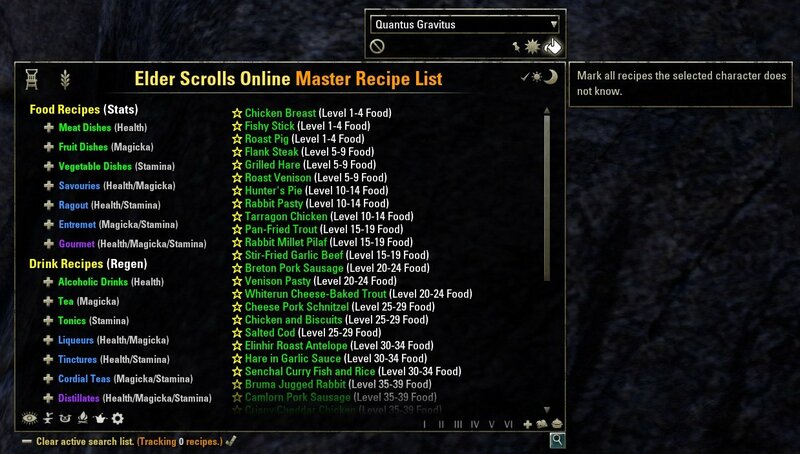 Fixed an oversight that could cause errors when you had the starter recipe for Roast Pig in your inventory (the one you get from the Provisioning writ starter quest if you don't already know it). Additionally, this recipe will now show the proper information about who knows it and what level food it creates just like the regular Roast Pig recipe would show. Thanks Anceane for the report! Significant performance improvement on the backend when generating tooltips and especially when creating the tracking icons in the inventory. Fixed tooltips were not showing for mail attachments. Thanks for an in-game report! Fixed format for food item ingredient list to ensure proper capitalization and also removed masculine/feminine notations, maintaining proper continuity with recipe ingredient list formatting. Properly unlocks recipe and ingredient items from FCO ItemSaver when the option to use FCO ItemSaver for tracked recipes and ingredients is disabled. Added new option (enabled by default) to show required ingredients on craftable food items, just as they are shown on recipes. If you have any of the required ingredients in your inventory or bank they will be highlighted white, otherwise they show as grey just like on recipe tooltips. Corrected a flaw in special character detection that would sometimes result in extra ingredients being tracked when using the feature to track ingredients needed by currently tracked recipes. Fixed a bug that would cause an error if you had the option to use FCO ItemSaver for tracked recipes and ingredients turned on, and disabled FCO ItemSaver without first turning this option off. Added nil value check to global tracking function and encapsulated the itemId lookup to only check if the item type is a match. More esthetic housekeeping of the code. Removed some old functions I didn't need anymore. 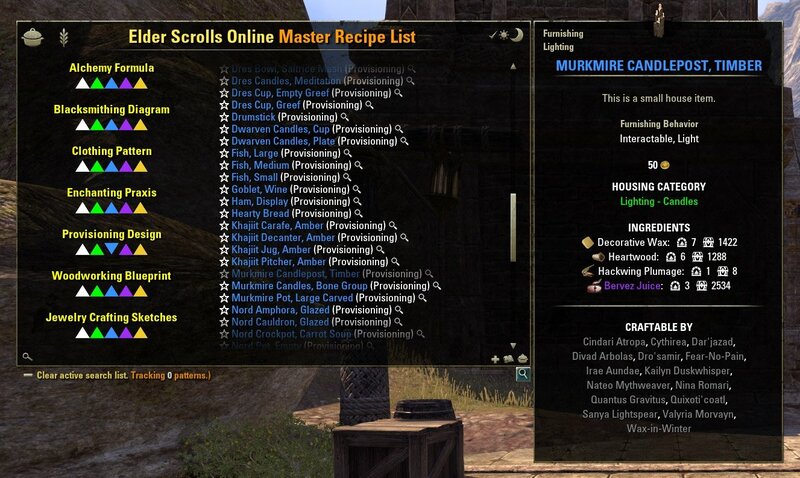 Future-proofed MRL in case ZOS adds new recipes and ingredients in the future. This will require a 1-time reset of all saved settings (see main description). My apologies for the inconvenience! Streamlined saved variables Set and Get functions, consolidating over 2000 lines of code to just over a dozen. Should free roughly 90kilobytes of LUA memory space. Various other code streamlining and improvements. Added support for FCO ItemSaver by request (enabled in new Third-Party Addon Support section of the options panel). When enabled, tracked recipes and ingredients in your inventory and bags will be marked with the FCO ItemSaver "locked" icon instead of MRL's, and will be set to locked in FCO ItemSaver. The MRL icons will still show in guild stores. Added new feature for addon developers to check if Master Recipe List is tracking a given recipe or ingredient (Boolean function). Added new German translations translation by Baertram. Added complete Italian translation by DarioZ (many thanks!). Fixed an oversight on my part where the fix I added in 1.25a was applied to the tooltips but not the inventory bag icons, and so it was still possible to get nil value errors if you had one of the "old" junk ingredient items in your inventory. Thanks Amevil801 for the report! Finalized French, German, and Russian translations (thanks to Khrill, Baertram, and KiriX, respectively). Minor code optimizations and esthetic improvements. Added refresh for inventory tracking icon display when changing settings. Minor improvement to the inventory tracking icon code. Implemented Russian translation thanks to ESOUI.com user KiriX. Cosmetic improvements for French and German version (re-aligned several popup tooltips when playing in these languages). Fixed UTF-8 encoding of manifext .txt file to be without BOM so that it can be properly parsed by ESO. Correct title and colors will now show in the addon list. Thanks merlight! Added "Needed by Current Writ" line to food & drink items by request. Completed French translation thanks to Khrill. Slight cosmetic improvement to the tracking and writ lines on tooltips. Added new feature: Global ingredient tracking profile. Save currently tracked ingredients to the global profile, and easily load it on any of your characters! Fixed a couple ingredients being out of alphabetical order. Several code optimizations for faster execution of various functions. Fixed a bug that would cause an "attempted to index a nil value" error when you would mouse-over one of the white quality "junk" foods you loot from cabinets, or if you had one of these in your inventory. Thanks for the reports! Added new recipe configuration panel! All characters that know any recipes and are tracking show in the list. Set up filters to auto-junk or auto-delete untracked recipes (see video below). Changed global namespace to eliminate potential for conflicts. Better language translations (roughly 60% non-Google). Added new feature: Click the kettle button above the search button at the bottom right of the recipe list window to toggle popup tooltips between showing the recipe and the created food for that recipe. Shift-clicking recipes while the tooltips are set to show food will link the food in chat instead of the recipe! Added "Craftable By" section to food item tooltips, which is enabled by the same global option that enables the "Known By" section on recipes. Added refresh when changing tracking status on any items, so check marks will update in real-time for any inventory or guild store list you happen to be viewing. The "needed by current writ" tooltip item has been changed to "unknown & needed for current writ" and will only show for recipes the current character on the writ doesn't already know. Fixed an issue that was causing purple recipes to appear green in the list when populated by text search. This bug did not affect the tooltips, but has been resolved for the list view. Made tracking icon setting global so you don't have to adjust itt per-character. Fixed an issue where the default position of the tracking icon would be off if you didn't have the Show Motif addon loaded, which changes the column size of the inventories. Added a separate slider to manually adjust the position of the guild store tracking icon position. Fixed typo in new recount function. Made settings menu functions local/private and re-bundled LibAddonMenu-2.0. Minor cosmetic tweaks to code. Added option to enable icons in your inventory/bank/guild store, etc. for tracked recipe's and ingredients (feature requested by @Sneak-Thief). Also, option to adjust the horizontal positioning of the icons. Fixed a bug that would cause your known recipes to reset their tracking state on relog, throwing off your current tracking count. Added full support for settings transfer via Joviex Settings transfer. Tracking status and total tracked counts will now properly update. Rebuilt addon structure to clean up the global table, setting everything but saved variable and necessary init functions to local/private. Re-upload: Added compatibility functionality for Garkin's Dustman. Track individual ingredients as well. Auto-mark all ingredients needed by all currently tracked recipes combines. Option to auto-junk unmarked ingredients when looting. Option to auto-delete unmarked ingredients when looting. Popup tooltips for all list items. Added tooltip support for mail, buyback, trade, and chat links. Added global option to turn on a new section at the bottom of the tooltips to show all characters who know the current recipe. The list is comma-space separated and elegantly formatted so that names remain centered and always leave a comfortable margin on either side even when multiple names fit on a single line. Added option to turn off tracking on a per-character basis, which will prevent just that character's name from showing in the new known list on tooltips. Thanks to a clever hack I have overcome the issue with lookups for provisioning writ requirements not working reliably in languages other than English! Better formatting for non-English languages in general, and better translations for German and French thanks to Baertram and Khrill respectively. Improved icons for writ and writ tracking items. Various code improvements and optimizations. Added improved German translation from ESOUI user Baertram (thanks!). Fixed a bug that would cause text searches not to work if you moved your mouse over the search box and away without clicking on it until you populated a list from the navigation menu or clicked in the text field, then out, then back in. Now works the first time all the time. Added addon settings option to switch between new icon-based list display and the older text-based mode. Fixed wrong LibAddonMenu-2.0 packaged without OptionalDependency settings. This newer version from GitHub seemed to be causing errors in some cases. Packaged latest from ESOUI and set to OptionalDependsOn: which should ensure you always have the latest version loaded. Should eliminate errors. Fixed bug where clicking the check button to look up writ requirements when not on a writ would cause the clickable list to give errors until you refreshed it by loading another list. New icon-based tracking for improved visual appearance. MAJOR update now includes full support for French and German localization. 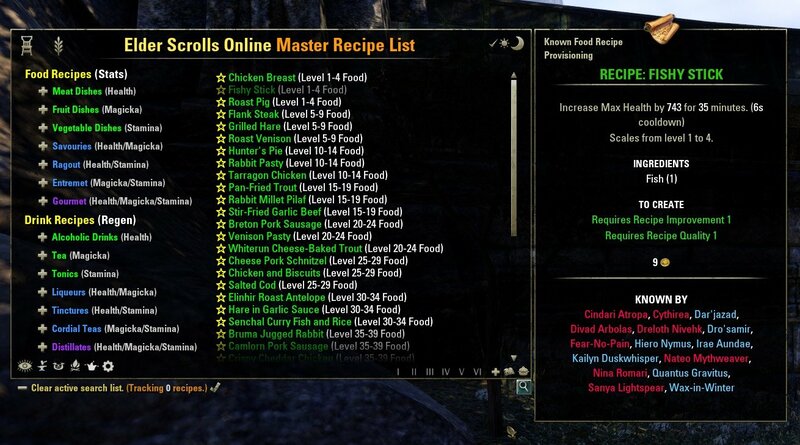 New Master Recipe List window with all recipes in ESO. Browse labeled and quality-color-coded categories or text search for recipes. Single-click search for all recipes required for current writ. Displays if a recipe is known, and allows clicking unknown to mark as tracking. 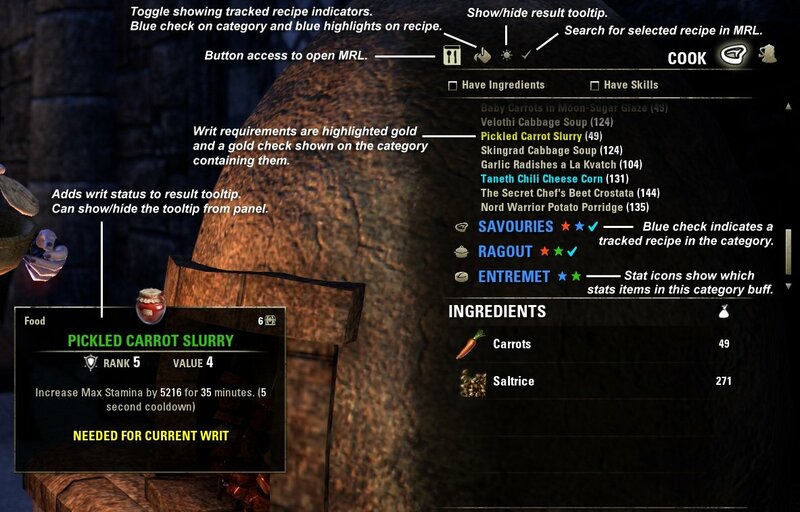 Adds additional tooltip info for tracked recipes and those needed by writs. 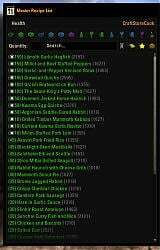 Displays the level of created food or drink on all recipe tooltips. Slash commands available: /pld , /mrl , and /recipes all show/hide the window. Removed debug output accidentally left active in last update. Added line to unknown recipes needed for current provisioning writ, making them easy to spot when quickly skimming through trade houses. Fixed wrong item ID for Stand-Me-Up Lager. Somehow this addon broke today and began showing the Unknown marker for items that were already known. Wish I could tell you why. I tried it by itself and i know that it's just this addon and not anything else causing it. First of all, thank you very much for this addon, it's a life saver! However, everytime I open up the recipe list to craft food for my daily writ, I get this error message if I close the recipe window without crafting anything. If indeed I do create the food item, the addon works great. Last edited by aog9128 : 04/13/19 at 03:27 PM. Guys, error reports do me little good without information about what you were doing when they happened and steps to reproduce the problem. Please include as much of such information as possible so I can track down the source of the problem and squash it! Last edited by Phinix : 04/10/19 at 12:31 AM. I have been testing the latest version for a few days and I have received no error so far. I think the test fix did it. Thanks for the update, good to hear it is working. Alas, I am still receiving the error message I reported, pretty much randomly when I use a crafting station. I am not playing in gamepad mode, but it is not easy to identify which mod conflicts with MRL, considering that I have 100+ addons I am araid I have to live with it. I also now have the problem that the game will no longer recognize and load the addon. It is in the correct folder. EDIT: My issue was not installing the new phinix library dependency. Working now. Last edited by Pevey : 04/05/19 at 08:23 AM. i added MasterRecipeList in my ESO live folder, as i always have done, but somehow it the addon no longer appear in the game. any ideas on how to solve this? The MasterRecipeList folder needs to be extracted to \Documents\Elder Scrolls Online\live\AddOns\ so if it is in the live folder that is the problem. If you don't have an AddOns sub-folder under live you will have to create one. I highly recommend installing Minion and letting it manage your addons, plus it will keep them all up to date easily as well. Oh... okay, forget it... You did it already... I didn't notice the update, sorry. Yep. Also added some nil checks to avoid possible indexing a nil errors as well. Good initiative though. so when ever control.node.data isn't a table, your code will be ignored. I didn't search for more occurences with control.node.data... that's your job. Last edited by RadioEriwan : 04/03/19 at 11:58 PM. Once upon a time in ESO developers bring up depending libs within their addons and those were loaded in another (i.e. without version-detection) manner than now. I changed the MasterRecipeList.txt in order to load your LibPhinixFunctions in old style and this caused my errors with lib.ASV, because the lib didn't recieve any events. With an outsourced lib (new method) I got other errors, so I guessed this errors came from those addons which doesn't use lib outsourcing (i.e. destinations, LoreBooks, aso), and it seems to be the right guess, because your addon works well, if I disable those non outsourcing addons. I think non outsourcing addons are loading outdated libs and newer outsourced libs can't be loaded then and this is causing the errors. Edit: What I like to say... These errors doesn't have to be your errors. Last edited by RadioEriwan : 04/03/19 at 09:51 AM. Thanks for the insight. I had no idea the game would be constantly calling PVP campaign updates in the background. I spend a lot of time sitting at crafting stations and never ran into this. I am assuming it only happens if you are actually in Cyrodiil while using a crafting station? It also seems totally bizarre to me that the UI would be rebuilding the tree/header for mouse actions of a menu that was not currently showing. The addon does make certain assumptions that if you are browsing a menu for a crafting station you must not be inside any other menu. Anywhere else in the game this would be a safe assumption but if the UI is loading menus for PVP campaigns behind the scenes while it isn't even showing that indeed is no longer a safe assumption to make. Regardless, it should be simple enough to add some nil/type checks for the data in question before actually processing it, which should keep the current functionality as it is while ignoring these behind the scenes calls. The whole reason I hook the tree headers like this is because there were no other exposed entry points available to register callbacks for all update actions required to maintain coloring and tracking marks on categories at stations when you do things like craft a recipe, open or close a category, mouseover a category, etc. Strange things (may) have strange causes. Strange to me is the conditions with loading librarys in ESOUI - old method (implemented) against new method (outsourced). Mixing both methods will cause strange things... believe it - that are those strange things one can't figure out by himself. You are absolutely right about strange things having strange causes. I would not have guessed ZOS would be constantly rebuilding a PVP selection tree behind the scenes when you were not even viewing that data, or that they would use the same variable name in the tree to sometimes act as an integer and sometimes as a table, and yet, apparently, they are. I am not sure what you mean about old vs. new methods however, unless you are refering to registering addons for version control using LibStub or simply letting ZOS's new version control handle it. I haven't converted my addons away from LibStub for several reasons: 1) I don't feel like nor have time to update ~20+ projects right now 2) LibStub is safe and not going away any time soon 3) there should be no problem even if using both as both simply register the addon in the global space and worst case scenario will overwrite the definition that gets set first which would cause no issues and is done all the time (pre-definition of functions overwritten later in code, etc.). Last edited by Phinix : 04/03/19 at 09:54 AM. I do not believe this is related to the errors being experienced. That's may be right, but you should believe it. Strange things (may) have strange causes. When something happens in some campaign, the ui will refresh the tree. When the tree is refreshed, it will also call ZO_IconHeader_Setup somewhere down the chain (see the linked line in the stack trace above ). If this happens while the player is currently at a crafting station, then GetCraftingInteractionType() will return a valid crafting type and MasterRecipeList will try access control.node.data.recipeListIndex in line 3674 (or 3672 in the new version). Since control.node.data is an integer, you get the "attempt to index a number value" error. Currently MRL will try to modify any ZO_IconHeader that is refreshed while the player visits a crafting station, instead of only the headers that belong to the crafting interface. Last edited by Shinni : 04/02/19 at 04:38 PM. People who know me from the Skyrim Nexus (Phinix Natural ENB, etc.) will know I am currently battling some very serious health issues (recurring hemorrhagic stroke from a brain cavernoma) which prevent me from driving, among other things. I am however still able to tinker around with addons. If you enjoy any of my work and feel compelled to help, I would sincerely appreciate even the smallest contribution. What some might consider "disposable income" could help a humble mod writer like myself with some of the basic necessities of life. BIG thanks to everyone who has donated over the years! Thanks very much lovi/maximar1607 for the Auroran Warhorse! Big thanks to @Sacadon for the generous in-game gold donation!